I am fascinated by the witch hunting that happened in the past. So many women died because of it and the social injustice is overwhelming. Any book that mentions it instantly ends up on my to-read list. Which is why I was disappointed this book, that starts with Maggie being wrongfully accused of being a witch, completely let's go of this storyline after a couple of chapters. Maggie and her grandmother, who isn't a warm and fuzzy type of grandmother, live in a small hut. Her grandmother knows somewhat about childbirth and the healing powers of plants. Because she's not nice and scares people, she's accused of being a witch and since Maggie lives with her, she must surely be a witch as well. Yes, people thought rationally back then. They're thrown into jail, but with the help of one of her grandmother's friends, Maggie manages to escape. Her grandmother, however, is not so lucky. On her way to the only family she has left, Maggie is joined by a girl her age, Annie, who was the main witness in her 'trial'. This girl wilfully accused Maggie of being a witch, though she knew it was wrong. She is the one responsible for her grandmother's death. And now she wants to travel with Maggie to her uncle. When the sheepherder who smuggles Maggie across the water can't take this girl as well, Maggie thinks she's seen the last of her. Sadly, this is not the case. A couple of months later she shows up at the doorstep of Maggie's uncle and worms her way into the family, quickly gaining the trust of Maggie's aunt and uncle. Trouble doesn't stop here, Annie betrays Maggie and her family yet again. This time it is Maggie's uncle who'll pay the price for her malice. Maggie will do everything in her power to prevent this. In theory, this should be a story that sweeps you up into the moment and make you heart pound, cause OMG, how will she figure this out? But it wasn't. It was an enjoyable story, but I couldn't connect with Maggie and this is were it went wrong for me. There were a couple of things that annoyed me: Maggie is supposedly beautiful, since several men are falling over themselves to please her, but she doesn't know this and has supposedly never seen herself in a mirror. I mean, really? Not even a reflection in the water of a pond or anything? Really?? I found it very hard to believe. I really, really disliked Annie. She seems evil for the sake of being evil. People take her in when he has nothing and she just up and betrays them. I also had a hard time believing Maggie was the only one who saw through her lies and how gullible her aunt and uncle were. 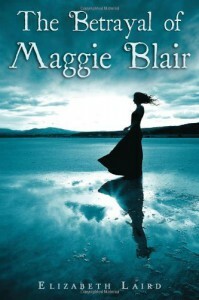 This book would have been a lot better for me if I had connected to Maggie. Because now, it seemed like just a summing up of bad things happening to someone.